I've been working with Eclipse 4.2 (Juno release 20120920-0800) on OS X 10.8.2 for a few weeks now, building apps for Android 3.0 and above. I have a quad core i7 MacBook Pro with an SSD, so performance is not an issue. Everything was fine. This will stay for a couple of minutes. 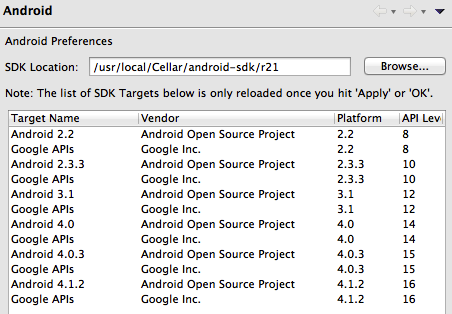 Then it goes on to do the same with Android 3.1 and other SDK versions I have installed. It basically hangs whenever the first autocompletion kicks in (e.g. after typing System.) or when I access the Android preferences before it has loaded. Reinstalling the Android SDK (via Homebrew), thus deleting /usr/local/Cellar/android-sdk completely. Reinstalling the AVD plugin (v.21) from scratch. What can I do to find out about the source of these problems and get back to a nice and clean state? and everything worked great again. Modify that path for linux boxes. Go to your workspace directory \workspace\.metadata\.plugins\org.eclipse.core.resources\.projects and delete all the projects in there. You can make a backup first, if you like. It stores your workbench settings (perspective state, file paths for menu options, etc.) But eclipse loaded and I didn't have to re-install anything like some answer suggest. And I haven't seen this anywhere. Often times, this problem can be network related. Check if your network is behind a proxy. If so, you need to configure proxy on Eclipse. For that, go to “Windows” -> “Preferences” -> “General” -> “Network Connections”, and fill in your proxy info. Restart Eclipse after that. Conversely, it’s also possible that you have configured proxy on Eclipse before, but that you are no longer behind proxy. Make sure to disable proxy then. Another solution is to clean up project-specific meta data directories which are stored under your workspace directory. Check if an adb process is running. If so, kill the adb process, and restart Eclipse. All the other solutions did not work for me so I simply deleted all the .log files inside the folder [workspace]/.metadata and it worked again! It turns out this problem indeed occurs when your internet connection is flaky, slow, etc. As soon as I got back to my normal internet connection, the content would load fine again, within less than a few seconds. I have tried all the solution but i didn't get solution. After that i have disconnected Internet and deleted ddms.cfg from .android folder -> open eclipse -> dialog of statistics send to Google? -> Selected NO and Finally Worked for Me. I have tried eclipse -clean command in Command Prompt and that also worked for me. Note: For eclipse -clean command first you have to select path of eclipse folder where you have placed. I'm on a Mac and using ADT, can confirm that the following worked for me. No amount of restarting the Eclipse, or rebooting the Mac was helpful. It seems that Eclipse gets into this stage because of stopping abruptly. I had to force boot my Mac and this issue seems to be happening since then. Install all the Docs in the sdk manager. echo "done! you can open eclipse now." shut down eclipse then go to YourWorkSpace\.metadata\.plugins\org.eclipse.e4.workbench and remove "workbench.xmi", now restart eclipse. I explained such approach in this post on my blog. All the above solutions didn't work for me. In eclipse Under Problems Tab check errors- You might see the unable to delete file and project path name. In my case target=Google,Google-Api-16 was causing the issue. Replace that and it solved. ... in that .plugins category. Add the following in your ~/.bash_aliases file. ~/workspace/MyApps is my workspace, you'll have to configure your's accordingly. Resolved the problems with the different versions related to android-support-v4.jar. They were mismatched which causes problems if projects are related anyway. The second one is not that obvious: I restarted the IDE from the shell, providing the $ANDROID_SDK_HOME - Environment variable. This got me a step further but the ide hangs on a different location. Providing $ANDROID_HOME finally got me all the way up again. BTW: After this procedure it was not necessary in following starts of the IDE to set the environment variables again. Not the answer you're looking for? Browse other questions tagged android eclipse macos or ask your own question.